Where, exactly am I going with this, you ask? Well, just like I don’t often add to the cords and cables stash, Andrew very rarely purchases a cookbook; in fact, the only one I can recall him seeking out in our seven years together is Michelle Tam’s Nom Nom Paleo, a hefty red book filled with novice-cook-friendly, often-Asian-influenced Paleo and Whole30-compliant recipes. So when I learned that Tam was coming out with a follow up, Ready or Not, I was quite eager to get my hands on a copy. In part, because I knew it was at least one book that would garner as much excitement from Andrew as it would from me, but mostly because I know that Tam’s recipes are consistently exciting, not-too-fussy, and healthful. Thankfully, and unsurprisingly, her latest book does not disappoint. It might just be the title I cooked from the most in 2017 even. Truly, it was a challenge deciding which recipe to share with you here. Other contenders I heavily considered included slow-cooker duck “confaux” and cumin cilantro lime cauliflower rice, but ultimately, it was this punchy shrimp recipe that won out. I’m not a huge shrimp fan, but cook it on occasion as it’s one of Andrew’s favorite things to eat, so I know that when I find myself nearly as into a shrimp dish as he is, that it’s truly-excellent stuff. 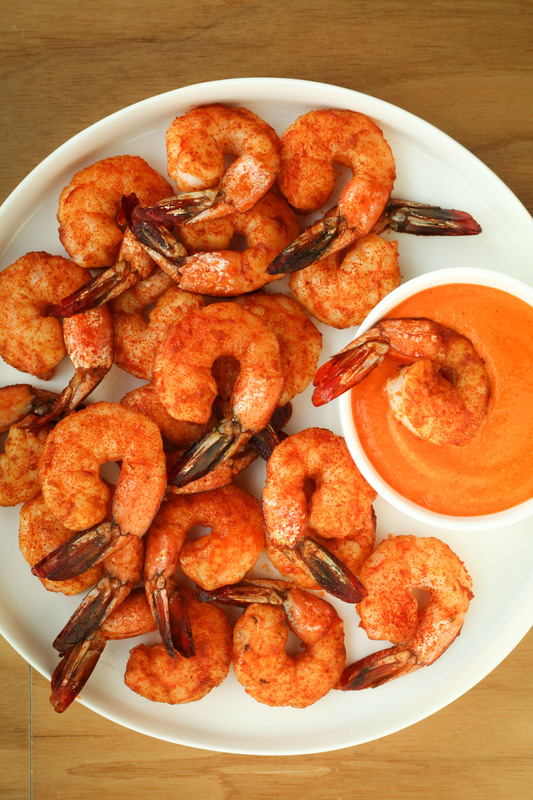 This won me over with its tangy dipping sauce, vibrant color (really, it’s practically neon), and ease of preparation (that is, if you outsource deveining shrimp). If you’re looking for a new cookbook to draw inspiration from in 2018 — even if you don’t care about the paleo aspect of this title — I highly recommend you pick up a copy. Author: Reprinted with permission from Ready or Not: 150+ Make-Ahead, Make-Over, and Make-Now Recipes by Nom Nom Paleo by Michelle Tam and Henry Fong, copyright © 2017. Published by Andrews McMeel Publishing, LLC. Make the romesco sauce: To take the bite out of the garlic, blanch it in a small saucepan of boiling water for 30 seconds, then scoop it out. Add all of the ingredients to a blender, and blend until smooth. Make the shrimp: If using frozen shrimp, thaw them under running water for 5-7 minutes in a colander. Meanwhile, preheat the oven to 400°F, with a rack in the middle position. Line a half-sheet pan with parchment paper. 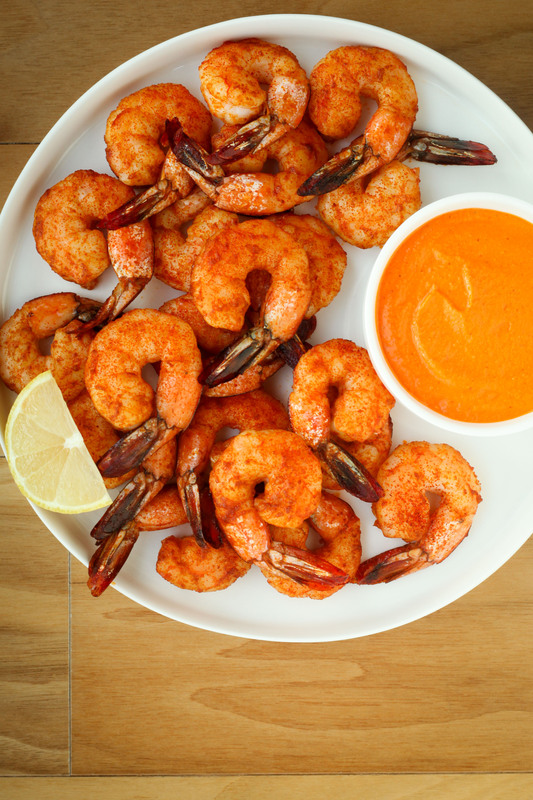 In a medium bowl, toss together the shrimp, 1 tablespoon of the ghee or oil, 3/4 teaspoon of paprika, and the salt. Arrange the shrimp on the prepped half-sheet pan. Roast in the oven for 6-8 minutes, or until the shrimp has just turned pink and opaque. Squeeze the lemon juice over the shrimp, then dust with the remaining paprika (a fine mesh strainer makes it easy to get an even coating). Serve with romesco sauce and lemon wedges. The second time I made this, I forgot to blanch the garlic, and to my taste, the romesco wasn't overpoweringly garlicky; that said, if you're sensitive to the taste of raw garlic, you may want to take that step. To save time, buy shrimp that's already peeled and deveined. Some fish counters sell shrimp already prepared this way, and most (if not all) fishmongers will do this if you call and ask ahead of time, or don't mind waiting a bit. I used equal parts hot and smoked paprika, rather than all smoked for a little bit of heat. While best hot, the shrimp are also excellent at room temperature.